The Red Sox continue to chug along with the best record in baseball by far. They just recorded their 90th win with 33 games left to go in the season. 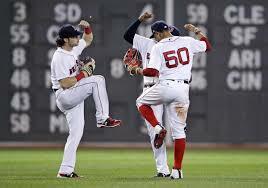 They are now 90-39 and no other team in baseball have yet won 80 games. They are 9 and a half games ahead of the second place Yankees in the division and seem to be set to win it unless something unforeseen happens in the last five weeks. Betts continues to lead baseball in batting average and at last count Martinez was tied for the lead in home runs. The later also leads in RBI’s and is only 9 or so points behind Betts in batting average. He could conceivably win the triple crown this year. All is going well for Red Sox nation at this point. The offense has been pretty good of late though a little inconsistent. They score big runs in a lot of games but are sometimes held to few hits and only 1 or 2 runs. It seems they are capable of going pretty long stretches without scoring runs and then have big innings of 3, 4, 5 or more runs. The scoreless stretches, however can sometimes last a full game or more. Let’s hope they can become a little more consistent once the playoffs come around or they may find themselves on the losing side if they hit an all too common cold streak. The pitching has been pretty good as well although there are a lot of injuries in the rotation, most notable of whom is Sale who is on the 10 day DL for the second time this month and by all indications he will be out longer than 10 days this time. We can only hope he will be ready to go come October and that he will be at the top of his game. He has been dominating when he has been able to pitch. We also have several other starters out including E-Rod and Wright. Thankfully Pomeranz has been put in the bull pen although it is questionable that he can be sufficient there either. Eovaldi has not been with the team very long but seems to have cooled off after two great starts and we don’t really know what we will get out of him. That just leaves Porcello, who is up and down though mostly up and Price who has been pitching consistently well for about 10 games or so. The bull pen is alright though not what you would call great. Most of the time they seem able to get the job done and do well but from time to time any one of them could have an off night and cause a loss. Notably, Kimbrell has not been the dominant pitcher we grew accustomed to the past two years but still seems adequate to close games. He still goes a good job and has blown only 4 saves all year, but he is just not as dominant as he was in the past. Barnes continues to do consistently well and Hembree has been very effective for the most part as well. Thornburg is good but not always successful and the rest of them get the job done most of the time. All in all, the pen seems about ready to make a run in the playoffs. So, with about five weeks to go things probably could not be much better. If we get Sale and E-Rod back and pitching well we will be ready to perhaps go all the way. Meanwhile the 2018 Red Sox are setting all kinds of regular season records and seem to be one of the best teams to ever play for Boston. We will see what happens over the next couple of months but so far we have had a great ride this year and can only hope for more. Once October rolls around, if everyone stays healthy, we should be able to play with and beat anybody to perhaps win it all. It would be great to see the Sox do it for the 4th time since 2000. It appears the curse of the Bambino may be over for good. They may have the chance to prove it again come October. Anyway, Go Sox! This entry was posted in August 2018 and tagged 2018 Red Sox, baseball, Red Sox, Red Sox playoff hopes, Red Sox setting regular season reords. Bookmark the permalink.